Grundy Electric sponsors four high school juniors from area schools within its service territory to attend leadership conferences. The top two finalists will be awarded the Washington D.C. Youth Tour and the additional two finalists will be awarded the Cooperative Leadership Conference known as CYCLE held in Jefferson City, Mo. Both leadership conferences are paid in full by Grundy Electric. The only expense to students would be if they wish to purchase souvenirs. Youth Tour - The Rural Electric Youth Tour is an annual week-long event in June when approximately 1,500 high school juniors from all over the country convene in our nation's capital to learn more about government, cooperatives, and rural electrification. 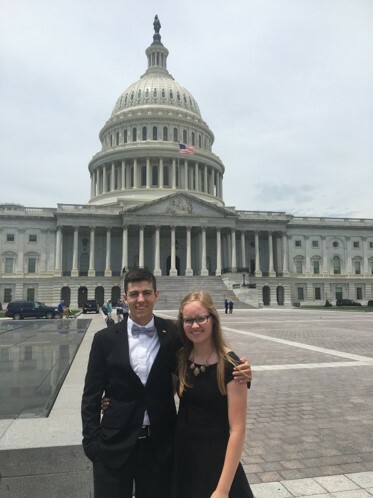 More than 100 students from Missouri will convene on Washington D.C. to enhance leadership skills and visit leaders in Congress. CYCLE - Area high school juniors can compete for a three-day leadership conference held in July at Jefferson City. This conference brings together the brightest young leaders from across Missouri. The focus is to teach students more about electric cooperatives, enhance leadership skills, and experience Missouri State government. Eligibility - Application is open to any current high school junior attending a school (including home schooled students) located within GEC’s service territory. Applications will not be accepted from students entering multiple cooperative Youth Tour contests. For additional information regarding our Youth Programs, please contact Peggy Boulware at pboulware@grundyec.com or call 1-800-279-2249 extension 23, or Karen Glenn at kglenn@grundyec.com extension 33. 2018 Washington D.C. Youth Tour winners; Grundy R-V student Kendra Betz, daughter of Scott and Sherri Betz and Ridgeway R-V student Ethan Billups, son of Scott and Sarah Billups.